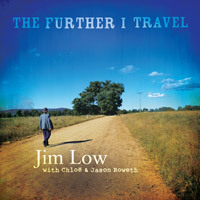 If you like stories of Australian history or anything at all related to Australia, you will love Jim Low’s latest CD The Further I Travel. It's obvious that Jim has read and travelled widely to collect the material for his songs - stories that are not only fascinating but authentic. In his songs such as Towns on the Castlereagh we can feel the spirit of the bush shining through. This is an exceptional collection of Australian songs. The gentle mellow backing from the talented Chloe and Jason on mandolin and guitar blend beautifully with Jim’s soft yet very clear lyrics. Much thought and time has gone into perfecting the sound and arrangements, all making for easy listening. The songs deal in lively images with such diverse themes as the hazards of whaling in the mid 1800s and boundaries of class and racism in early settlement. We see another side of the explorer Ludwig Leichardt in Dreaming with Open Eyes. There is also a song about Luna Park where the silhouette artist would sit cutting facial outlines. Funnily enough he was a rival to my dad, the portrait artist at many shows! Studying Australian history at Armidale in the 1980s I too was horrified as I read of the shameful massacre of innocent Aboriginals at Myall Creek in 1838. Jim's rendition of this incident is moving and poignant. The pain suffered by lovesick Robert O'Hara Burke on his expedition after having to leave his sweetheart behind is sweetly expressed in his song The Further I Travel (the title song). This is only half the songs, 14 in all and most on different aspects of Australian history. With so much depth they deserve more exposure. They’d make good studies for students of all ages. Finally, what a treat for Jim to have his own daughter, Susannah do the design/artwork with that professional touch. All the words of the songs are set in amongst some fantastic photos in an attractive booklet. The fact that Rouseabout Records have signed Jim to their label says a lot for his songs. Eric Bogle and Gary Shearston are also on this label. Congratulations Jim!